Here’s a direct link to my video entry on the contest page! What’s up, Kaijucast listeners, I am here with a plea! That’s right, I’m totally attempting to use my fan base, supporters and visitors to the website in an effort to garner votes for this amazing contest currently being put on by Legendary Pictures. It’s called the Ultimate Fan Contest and it’s currently in the public voting stage. You’ve probably heard me talk about it on the podcast, but the winner gets chosen to attend the London Premiere of the new Godzilla film. Plus he/she also gets to check out the press junket and….AND… the opportunity to interview Gareth Edwards, the director of the new Godzilla film. 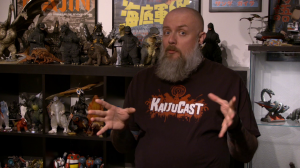 Thanks for your help, we shall return with another Daikaiju Discussion in about a week!